In Ep. 046, Tim talks with Meg Brunson. Meg is the founder of EIEIO Marketing, and an entrepreneur/digital influencer. Meg left a job at Facebook to start her own marketing firm helping businesses successfully market their products and services on Facebook! They talk about how to properly utilize Facebook ads, and some of the best ways to get the most for your dollars. They also talk about work-life balance. Meg has four young daughters at home, and she tells her tale of how she’s able to be an entrepreneur AND a successful parent. Tim Mullooly: Welcome back to Living With Money. On today’s episode I’m joined by Meg Brunson. Meg is the founder and CEO of EIEIO marketing and a digital media influencer as well. Meg, thanks for coming on the podcast. Meg Brunson: Thank you so much for having me. I’m really excited. Tim Mullooly: For the listeners out there, can you just give us a brief background into yourself and how you got to where you are today? Meg Brunson: Sure. So I was a criminal justice major in college, totally random, just kind of did what I thought I wanted to do. Became kind of an accidental entrepreneur pretty early on, abandoning everything that I had learned in school to jump into entrepreneurship. So it has been a wild ride which has resulted in me actually landing a job at Facebook because as an entrepreneur I was leveraging the Facebook platform to build and scale my business. So then I returned back to the corporate world for a short time because I thought Facebook would be a cool enough place to work that I wouldn’t mind punching a clock again, but I was mistaken. I worked there for about a year and then returned home about 18 months ago because I really wanted to be a more present mom to my kids and so I’ve launched a new business 18 months ago that really takes my expertise in Facebook marketing and leverages that to help other entrepreneurs, most often parent entrepreneurs build and scale their business using Facebook marketing so that they can build and scale their business while also being the parent that they really want to be. Tim Mullooly: That’s awesome. Can you talk a little bit just go back about your time at Facebook and what that was like and how that kind of helped shape your career? I know you just mentioned some of the stuff that you learned at Facebook is now what your new marketing firm does, but could you just talk a little bit about your time at the company? Meg Brunson: Well, it definitely was as cool as you’d kind of imagine it would be so I want to say that. I left entrepreneurship because I thought it would probably be the most fun place to work and it totally was. I could go on and on stories of all the fun things that they allowed us to do. I remember on numerous occasions finishing all of our work early on a Friday and going in to play catchphrase in an office with your supervisor and a couple other people off the floor. Just some really fun times, but it was a job. So I’ve been able to take a lot of what I did there and apply it to the agency that I’m running now. So almost every single one of our policies and the structure of our business is modeled after what my role was at Facebook. It’s one of those situations where it’s like why recreate the wheel. Facebook has a ton of money and resources at their disposal so they make a lot of their decisions very strategically and I was able to see the success of those policies and procedures and then apply them in my own business. For example, we work with all of our clients on a minimum of three month commitment which completely parallels how Facebook’s marketing expert program is run where while I was working at Facebook we were assigned to work with our clients on a three month basis. Because that was the timeframe that research and statistics and all of that good stuff show was needed to identify the goals and the strategy that was needed and then make those implementations and then make tweaks adjustments and optimizations. So oftentimes people want to outsource marketing, for example, and see instant results. It just turns into an ATM machine. You put money in, you get money out, but that’s not the way it works. It’s a process and it typically takes three months to really find your footing. Tim Mullooly: Apart from the Facebook aspects of ads for your new marketing firm, how else does your firm help its clients and what’s kind of the process like when you start working with a new client at your firm today? 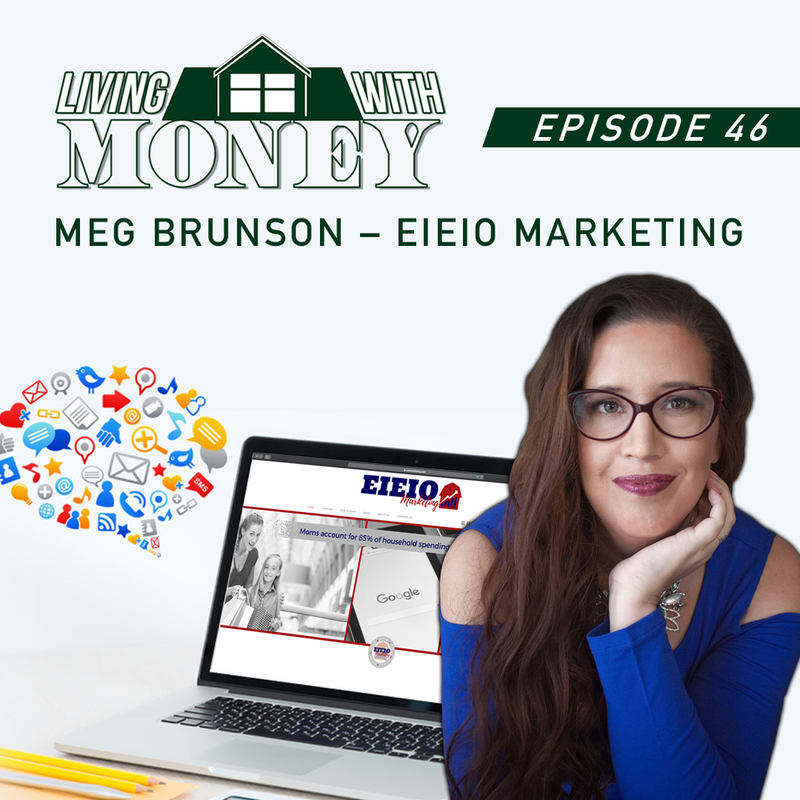 Meg Brunson: Well, our agency has that primary focus of Facebook advertising where we really are focused on just that one aspect of marketing your business. However, we provide some strategy and consultation when it comes to things like your actual Facebook page, your organic social media presence, one thing pages. Because a lot of people don’t know that when you run ads Facebook will look at the URL that you’re directing them to to see what is on that page. So we’ve seen a lot of ads be denied because landing pages aren’t compliant. So we do some consulting on that aspect of things and ensuring that the complete funnel is built out, email sequences and things like that. I think one of the things that I was inspired by while at Facebook is that I wanted our agency to be an agency that had our client’s best interest at heart. We do all of our work within our clients owned assets. We really want to set the client up for success even beyond when they’re working with us. So I’ve seen a lot of agencies kind of trap their client by creating assets that are owned by the agency and then when it’s time for the client to move on, for whatever reason, the clients kind of left starting over from scratch and we didn’t want that. We want our clients to stay with us because we’re providing them a superior customer service experience and we’re getting them the results that they want, not because the thought of starting over is exhausting. We’re really focused on doing what’s best for the client and equipping them to be informed on the process too. So when I get a client who’s like, “Oh, I don’t want to learn Facebook. I just want someone to do it for me.” It’s a red flag for me because if you don’t know the basics, how do you know that your agency is doing what they should be doing? So I really want to educate people so that they’re not getting taken advantage of. I’ve seen a lot of that. Tim Mullooly: Yeah, I think that that’s a really smart idea because you need to have a little back and forth with the client to make sure that your helping them reach their goals so they kind of need to know what’s going on as well, it can’t be completely hands off. So I’ve read on your website it says, “Not the typical marketing expert.” Apart from working with the client and kind of like you said not trapping them, what else separates you from what the rest of the marketing world does? Meg Brunson: Like I always say I was an accidental entrepreneur, so that’s where that comes from. I’m a criminal justice major. I’ve never taken a college business course in my life, in college and it sounded like the most boring thing ever. So I’m not a marketer. I’m not one of those people who growing up was like, I’m going to be a business person and went to school. I don’t know, I just don’t really identify as a marketer even though I know at my core that is what I am now, but I feel like I come from a place of accidental entrepreneurship of just chasing your passions and trying to figure out how to make it work when none of it really makes sense in the beginning. I find that I’ve got a really great ability to break the concepts down into a way people understand them. Tim Mullooly: Right. At least, and correct me if I’m wrong, but being outside the box and kind of not being a traditional marketer, for me if I heard that from my marketing team I would think that that would be the best thing possible because you want to stand out. So if your marketing team is standing out, the content that they put out is going to stand out as well. Meg Brunson: Sure. And of course, at this point I’m very invested in marketing my clients so when I say I’m not a marketer, I definitely don’t mean I’m not doing them justice. I’ve learned a lot, I’m very self-taught a lot of professional development in the years after college and that’s what really sets me apart there. The other interesting thing though is when you think of college marketing, anybody who’s over the age of 25 didn’t learn social media marketing in college anyhow. So even if you have that fancy schmancy marketing degree, Facebook marketing wasn’t a thing. Tim Mullooly: Yeah, so that degree is outdated already. So you got to stay up to date. Having that degree is essentially not really a head start. Being an entrepreneur and you also mentioned being a mother of four young daughters, it’s got to be a difficult task to juggle all of that at once. Can you talk a little bit about your work life balance? Because I feel like that’s a big thing for a lot of people that they struggle with. Meg Brunson: Yeah. So I’ve got four little girls right now. They are 3, 5, 7 and 11. So at this stage in the game three of them are in school most of the time. I feel like they have vacations every other day, but they do go to school most of the time so that is nice. A lot of it is just communication. I’ve gotten really good at communicating with the kids so that they know what to expect from me and what to expect from my day. Today for me is super crazy with back to back phone calls and they’ve already been prepared that I can’t be bothered today. It’s not a perfect system. I had a conference call this morning with six people and I had left the door open and my five year old came in and spent the entire time behind me just watching. Now, she was quiet, but there was definitely a part of me that was like, “Yep, there’s my five year old in the background watching my conference call.” Now luckily, all of my clients know my story. They know that my family is why I do what I do so nobody’s put off by that and because I have this open door policy, I think it’s very … I’m not saying this is a bad suggestion, but it’s a very common suggestion to keep the door closed, keep those lives separate. But I try to keep my door open when at all possible. Now, when I’m recording a podcast like this, for example, my door is closed. It is locked, but most of the time I try to keep the door open because I believe that by allowing them to come in and participate in the work process we’re able to teach them the ways that they should be reacting. So the fact that my five year old was in here for half an hour during a business conference call in which I had to be very present. I mean it was really talking about marketing strategy. So I wasn’t just a passive observer in this meeting and she just sat there. I think she coughed once. Other than that, she was silent. Meg Brunson: Right, and they’re kind used to this stuff. I had a similar situation where my three year old was in here coloring during a conference call and when her dad came to check on her she just looked at them and said, “Shush, phone call.” She knows. You have to know your kids of course, but I really love involving the kids as much as possible even if that just means they know they can come in and color when I’m on the phone but they can’t talk to me or fight or scream or because they’re kids. And we’ve got some nonverbal cues that if they come in and it’s not a good time, I will give them the one minute hand signal out of view of my camera. So there’s some little tricks that we’ve set up that communicates without having to verbally communicate. So we’re big on some of those tips as well. Tim Mullooly: Yeah. You said a lot of your clients know that the family aspect is a big part of who you are and why you do what you do. Do you find that being open and transparent with your clients also helps in terms of if for some reason your kid does happen to walk in and start fighting, they’re more okay with it, it’s not a big deal in terms of the eyes of the client? Meg Brunson: Yeah. Well, a lot of my clients happened to be parents as well. They’re not always parents of young children, they could be parents have an older child or even I have one that’s a pet parent, so they have four dogs. We always joke around about how it’s pretty much the same situation there are four dogs and my four kids. But it’s also just a stress relief for me so I don’t have the anxiety that I had at the beginning where I started this business. I mean, when I started this marketing business and my kids were home and especially I started over the summer really ramping up so the kids weren’t in school and I used to have a lot of anxiety. Like, oh, what if the kids come in that people will think I’m unprofessional, I’m going to lose clients. But now that it’s just out there, I don’t have the stress. I’m not worried about if a kid walks in right now because I’ll handle it. I might have to hit pause on the phone and I might have to go out there and clue my husband into the fact that he lost a child and I found them and it’s also communication with my husband. So that’s another thing I haven’t really talked about is that my husband is super supportive of me growing this business and he goes above and beyond to take care of the kids in the household when I’m working. So it’s definitely a team effort. Tim Mullooly: Definitely. Obviously every family and situation is going to be different but would you say that finding the right work life balance for other people is all about communicating as well and just finding out what works for them? Meg Brunson: I think a big part of it is mindset and it’s understanding that work life balance for one person is going to look different than balance for another person. There’s a lot of people actually who say that balance doesn’t exist. Striving for work life balance is an ultimate fail because it doesn’t exist. I think it does exist, but I think it’s how you perceive it. You just have to know that what you see in other people isn’t their real life either. So that’s another issue with social media. You go on Facebook and you’ll see pictures that make it look like somebody has it all together and I promise you they don’t. So not comparing yourself to other people and really getting clear on what makes you successful as an entrepreneur and what makes you successful as a parent. And I think that was the hardest part for me, it was initially I had all these goals and these guidelines for entrepreneurship. How much money I wanted to make, how much time I wanted to spend, what I could use to identify whether I had found success but I didn’t have those things with parenting. And I remember talking to a guest on my own podcast and she was the one that had said you have to identify what makes you a successful parent. And for her what it was was if her children were happy, it was just that simple. Are her children happy? And so she measured that every day by asking them at the end of the day, did you have a happy day? And if they said yes, she was a good mom. It didn’t matter if the dishes were piled up or if the laundry was in a pile on the floor or if the house was a disaster. Tim Mullooly: So it’s all about potentially changing your perception or finding ways to measure what you’re doing in terms of parenting and kind of realizing that as long as the kids are happy then you should be happy as well. Having worked at Facebook and developed this niche around Facebook marketing, I’m sure that there’s a million different ways to market your business online on Facebook. What are just a couple of ways if you had to pick a few that small businesses can really the most effective way to utilize their dollars on Facebook or to grow their brand on Facebook? Meg Brunson: Sure. I think the number one thing that I would encourage an entrepreneur to either ensure that they’ve already done or do today is install the Facebook Pixel on their website. You know what the Pixel is? Tim Mullooly: I do. Do you want to explain that for the listeners who might not? Meg Brunson: Yeah. It’s a little snippet of HTML coding and you get it from your Ads Manager, so you go back into Facebook Ads Manager and you copy the Pixel code and then you paste it into the header of your website. It’s not visible, so it’s like an invisible tracking system so that Facebook can track the people that go to your website. This will allow you to build audiences of people who visited your website that you can use for including them in audiences if you want to remarket to your existing website visitors. You can also use it to exclude those people. So if you’re running let’s just say and ad because you want to sell a product, you could exclude people who have already purchased from your website so you’re not wasting those advertising dollars. And then you can use that Pixel to track conversions from your ads so that you can actually see the return on investment and to optimize your ads so that Facebook will be able to find people that are most likely to visit your website and complete other conversions on your website. So it’s a really important tool. There’s no cost to use it, so it’s a free tool and it retains data for six months. So even if you’re thinking, hmm, maybe I’ll run Facebook ads but not right now. Now’s not a good time, maybe in a couple of months. The Pixel is a great thing to get installed sooner rather than later because it will retain that data for six months. And it can also provide some analytical data similar to Google Analytics, but it actually tracks totally different from Google analytics. It provides just a different perspective. Tim Mullooly: Our firm has run a handful of Facebook ads as well and you can get pretty granular in terms of who you want to target on Facebook, right? Meg Brunson: Yes. There are so many targeting options. First of all, they’ve got a lot of options for targeting custom audiences. So you can upload your mailing list and it will match Facebook profiles to the emails that you have on a customer list so you can remarket that way or again exclude audiences that way. You can use engagement on your Facebook business page, engagement on your Instagram business page which is exciting, to build audiences that way. And then you can also create lookalike audiences which basically take any of those custom audiences I just mentioned and tells Facebook to analyze that data and then find you more people that are like those people. So it’s a really cool and quick way to leverage prospecting audiences. But if you don’t want to trust the algorithms, you can also go down into, they have interest based targeting where you can target everything from job titles that people identify they work at, income which right now is based on the zip codes in which they live. So you can target people who live in the top 5% of the most affluent US zip codes for example. You can target parents, parents of kids in specific age ranges. The list goes on and on, and tons of behaviors, demographics and interests that Facebook allows you to target. Tim Mullooly: Yeah, it’s really awesome. When I was looking around in there it’s remarkable how specific you can get with some of your ads. One thing that I personally kind of struggled with was with Google and also Facebook, It seems like sometimes the rules or best ways, best practices when running ads change constantly. how can people kind of stay up to date in terms of what is best to do with your ads on Facebook? Meg Brunson: So I follow the Facebook business page, like the face … Gosh, that’s so confusing. So on Facebook there’s business pages and then there’s a business page for Facebook for business. So hope that’s clear, as confusing as that can sound. So I follow that page. I actually also follow Mark Zuckerberg. He will sometimes just post random stuff about his family, but he’ll definitely post if there are major changes to the platform. There were recently some major changes to targeting and he posted about those. There’s also a couple different URL, different subscription options where you can actually get emails with those updates. So I don’t have those super handy but I’m happy to email them to you if you want to add them to the show notes. Tim Mullooly: Yeah, absolutely. That’d be great. Is there any sort of misconceptions that you hear about advertising on Facebook that you’d want to set the record straight on? Meg Brunson: I have two. The first thing is I see so many people that ask about the difference between a boost and an ad, and it’s one of my biggest pet peeves because people seem to think that a boosted post is not an ad. But really you’re spending money to boost a post, it is a type of advertising and you really have to think of it that way. I’m big in mindset, if you don’t think you’re running ads, you shouldn’t be investing money into Facebook without a plan to get it back. So do not boost a post if you’re not thinking strategically about advertising. So all a boosted post is a specific type of ad that’s also called a page post engagement ad. The difference between from your page and running a quote “ad” is where you build the ad. So there’s two different interfaces where you can create advertisements on Facebook. One is directly from the business page and that is kind of like when you go to the grocery store and there’s a bunch of food right in the checkout line, that’s like the interface on your page. It’s quick, it’s easy, they’re trying to get people to make those impulse purchases and oftentimes when people do that, they’re not being strategic. It also doesn’t have the same depth of customization options available to it. So I always tell people, don’t run ads from your page, but boosting posts in itself isn’t always a bad idea. It’s just if you want to boost a post, you want to actually physically go into Ads Manager, select engagement as your objective and then create that boosted post or select the post from within Ads Manager so that you have the full customization and optimization options available to you. Does that make sense? Tim Mullooly: It does. Yeah, I know exactly what you’re talking about with the two different interfaces. Meg Brunson: So the other thing, it’s much simpler and smaller so that won’t brain hurt as much. We talked about a little bit about the targeting options that Facebook has. You can target parents and zip codes and all of this stuff. You can also target an abundance of interests, just interests and almost anything. And the most common misconception that I hear there is that people think that they can target other business pages. So I always use our good friend, Pat Flynn is my example. I don’t know if he knows that I always use him as our example. So Pat Flynn is an entrepreneur. He has a business page that’s called Smart Passive Income with Pat Flynn and that topic is targetable within Facebook Ads Manager. So if you go in to create that ad and you want to target fans of Pat Flynn, is always what I hear, people seem to think that if you add Smart Passive Income with Pat Flynn, that you’re going to target his fans and that’s not how it works. Facebook considers the fans that you build on your page your fans and they’re not going to let other people target them. The only Facebook page fans you can target are your own. So when you’re targeting what Facebook actually does is it does pull those page names as targetable interests, but people get into those segments based on their online activities within the past 28 days. Let’s just say somebody’s listening right now and they’ve never heard of Pat Flynn before and they’re like, wow, I got to go check this guy out. So they go and they like his page right now. For the next 28 days they will be in his targetable audience. However, if they remain his fan but never again go to his website, type his name, click on any of his products, services or podcasts, he’s nothing to them anymore based on the content that you engage with and not the pages that you like. It’s a slight distinction, but it is a distinction. And if you go look at how many fans Pat Flynn has, it’s significantly larger than the number of people that are in that targetable audience within Facebook Ads Manager, which just goes to kind of identify that it’s not really the fans of that person. So just a quite distinction, but it’s something that I learned while I was working at Facebook, but now every time somebody says it, I just want to correct them. Tim Mullooly: I mean, I feel like that actually works in the whoever’s running the ads favor because you want someone who has been engaging with that page or with their content in the last 28 days because that means that they have recently been active in their content. Do you agree or? Meg Brunson: I definitely agree. And the other thing I want to mention on that too is Pats not highly controversial, but let’s switch topics really quick and we’re not going to dive, we’re not going to get crazy. But let’s think about Donald Trump. Let’s just say I want to target people who are interested in Donald Trump. So I put his name in there and I get this ginormous audience. There is no way to determine if those people are interested in his success or his failure. So this is not a positive correlation all of the time. So if you’re trying to target something that’s a little bit controversial or a lotta bit controversial, you’re going to want to keep that in mind when you’re targeting. So by targeting … I actually did run some political campaigns this year for political candidates locally and when we targeted people who are interested in that political party, we got a lot of haters because it’s not just a positive interest, it’s any engagement with that content. So that’s just something else to keep in mind. Tim Mullooly: That’s true, and I feel like that’s a good point to make because that is counterintuitive I think to what people would normally think. You would just naturally assume that they’re all going to be positive impressions there. Meg Brunson: Right, and it’s certainly not the case. Tim Mullooly: Yeah, definitely. Especially, like you said, the more controversial, the more potential for negative impressions as well. Meg Brunson: I don’t want you to think I was going to take this political. Tim Mullooly: No, of course, that’s a perfect example though of what you’re saying. While we’re on the topic of setting the record straight, are there any misconceptions about just entrepreneurship or maybe work life balance that you wanted to address? I was like, “Oh, that’s a great question. I don’t know.” Does target pay pizza hut to come in and sell their stuff or does pizza hut pay target to rent the space? And so I didn’t really know the answer right off the top of my head so we had a discussion about that, about how businesses collaborate together and then she was able to draw connections to some of the people I collaborate with and it’s like they pick things up that you don’t even know that they’re picking up and we’ve had some really cool conversations related to business topics that they wouldn’t have had if I always had the door closed. So I try to always just communicate with my kids on a level that’s above where I think they are. It’s still age appropriate for a course. Tim Mullooly: Yeah, that segues nicely into my next question. I was going to talk you said that you involved your children in age appropriate ways. Other than having these interesting conversations with your kids, what are some of the other benefits that you’ve noticed from that? Or is it kind of just remarkable as to what they pick up on even despite being at such a young age? Meg Brunson: Oh, it’s been amazing. So especially my oldest, she’s always been a smart kid, but once she started school I feel like things just went down for her. School is not her ideal learning environment, that’s not how she learns. About 18 months ago when I made this big switch from corporate to entrepreneurship, again, I started involving her in the process and it was about a year ago now that we decided to allow her to create her own business. Now, it’s kid size, but she did come up with her own business plan and what the business would be about and she named it and she did all of these things and last year was the first year that she brought home straight A’s. It was incredible. And when I say it was incredible, she was failing. It wasn’t like shifting from B’s to A’s, it was like she’s never gotten an A in math in her life and she brought home her first A’s in math and I credit a lot of it to giving her a reason to want to learn math. She needed to know how much money she was going to earn. We follow this rule of thirds when it comes to how much money you actually keep. So a third of the money she can spend, a third goes into savings and a third she donates back to a good cause. So she’d have to get this money and she would have to divide it by three every single time which wasn’t always an easy, it’s not always $9 to do the division. And then she would have to identify what did she want to buy? And there’s tax. She absolutely hates tax. She doesn’t know why we have to pay it. And so she has to do all that math to figure how much money does she need in order to go to target and buy the fidget spinner that she wants. And I think the fact that she’s been able to find a way or find a reason that math matters has changed the way she shows up in school. It’s been amazing. Tim Mullooly: Yeah. So once you had that real world application to what she was learning on paper at school it kind of just clicked? Tim Mullooly: At least there’s motivation there to continue the learning process. Meg Brunson: Exactly. She calls me her business coach. She loves working together on this stuff as silly as that sounds. And don’t get me wrong, she’s outside playing right now. My kids are still very much kids, but she knows that I love entrepreneurship the same way that somebody else’s dad might love softball. And so she enjoys being coached in entrepreneurship because that’s my softball. You know what I mean? I’m not going to be the softball coach. She actually went with me to her first business conference last year. It was a three day conference in LA and I was speaking so I was able to just kind of get her a tag along ticket with me and she blessed her heart, sat in the front row and she brought a lot of snacks. So she definitely ate a lot of snacks during the presentation but she also took notes. She wrote down the cutest little notes. The one I remember said no plus like plus trust equals dollar sign. There you go. She loves going to those conferences and asks me all the time if she can go to another business conference. It’s not always feasible, but I like being able to include her when it does make sense. Tim Mullooly: Yeah, I mean that’s awesome. And you had mentioned before a guest on your podcast, so your podcast is called FamilyPreneur, right.? Tim Mullooly: So what are some of the biggest benefits that listeners can hope to get from listening to your podcast? Meg Brunson: Sure. It’s so FamilyPreneur. Some of our episodes focus much more heavily on family, some focus more heavily on entrepreneurship, but it’s really about that definition of balance. How do we find balance in those two aspects of our lives because they’re both so similar and so important. And we also have a focus on raising entrepreneurial kids. So as we’ve touched on, introducing my kids to entrepreneurship has been an amazing experience for them and it’s not like I think that they need to be entrepreneurs, that’s not it at all. My seven year old I’m fairly confident she wants to be a teacher and I can see that happening and I’m totally in support of that. But these entrepreneurial skills are only going to help her no matter where she goes in life because they’re really just skills of leadership, philanthropy, things that are beneficial for anybody. So that’s what the podcast really focuses on. Like I said, some episodes talk about parenting and getting your kids to listen and things like that, which is important if you’re a parent entrepreneur, because if you’re not parenting well then you’re not working well and if you’re not working well then you’re not parenting well. So it’s addressing both of those aspects of our lives. Tim Mullooly: Awesome. We’ll definitely link in the show notes to the podcast as well, for anyone listening out there be sure to check that out. Meg I have a couple of questions left for you before we let you go. I like to kind of wrap up with these last two questions with all the guests. So whether it’s personal or professional, what’s one piece of advice that you’ve gotten that has really stuck with you throughout your life? Meg Brunson: I feel like it’s cliché as it is, when I was little I always got that message that you could be anything you want it to be. That was just the message and it’s cliché and generic. I think it faded over growing up and over your teenage years and your early adulthood years when it was like, well no, you can be anything you want to be. You have to go to college and you have to pick a major and successful people are doctors or lawyers so which one do you want to do? All of a sudden your choices all went away. But I think that that’s resurfaced for me and I’m really trying to give that message to my kids in a way that’s substantial. Not just you can be anything you want to be, but you really can do anything you want to do. There are professional cuddlers out there. Anything you want to do is attainable as long as you’re safe and it’s legal. That’s something that I think has just stuck with me even though the message it was silenced a little bit and I wish I hadn’t abandoned. Tim Mullooly: As you were saying that I kind of felt the same. You hear that a lot and it is a cliché as a kid, but I feel like at some point it fades, but then at some point it comes back for everyone and whether you listen to it or not is crucial I think. Meg Brunson: No, and I think that is the crucial point because not everybody listens to it or not everybody believes that when they hear it. Tim Mullooly: So kind of flipping that question around for you, what’s one piece of advice that you would give someone, maybe an aspiring entrepreneur? Meg Brunson: It’d definitely be that piece about failure. That failure is inevitable and it’s not a bad thing. I like using the word failure because that’s what people feel and that’s what people say, but it’s not really a failure. When you fail, it’s a learning experience. It’s an opportunity to pivot and go forward in a different direction that’s going to be stronger. So I would encourage anybody who’s considering embarking on a new entrepreneurial journey to just do it. It’s going to be imperfect, don’t wait for it to be perfect. You need to fail in order to find success. So Gosh, somebody said this, take messy action. I don’t know who said that, somebody said it. But it’s just take action, just do it. It’s going to be messy. You’re probably not going to succeed on the first try and that’s okay. Most of the people that you know that are super successful didn’t succeed on the first try. So just act, be okay with being a little messy and course correct as you go, but don’t be discouraged by what looks like a failure. Tim Mullooly: Meg that was all the questions that I had for you today. Thank you so much for taking the time to come on the podcast. Meg Brunson: Thank you so much. It was a lot of fun. Tim Mullooly: For the listeners out there, we’re going to link in the show notes to Meg’s podcast and everything that we talked about in the episode here today. So thanks for listening to this episode of Living With Money and we’ll see on the next one.